Injury Victim Faces BANKRUPTCY Due to New Insurance Law | Hupy and Abraham, S.C. In Canada, a 34-year-old motorcyclist was T-boned on a rural road and sustained injuries so severe that the police mistakenly pronounced him dead. Despite suffering brain trauma, internal organ damage and multiple broken bones, his injuries are not considered “catastrophic” according to new insurance legislation that took effect that very day. If Ontario native Adam Bari’s accident had occurred 12 hours earlier, he’d have been eligible to receive $2 million. 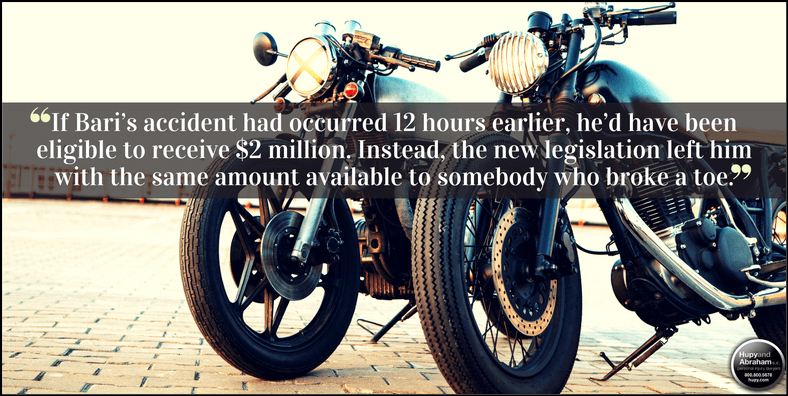 Instead, the new legislation left him with $86,000, the same amount available to somebody who broke a toe in an accident. Under the old legislation, injury victims with a certain score on the Glasgow Coma Scale (GCS) automatically qualify as catastrophic. Bari’s GCS score would’ve been ruled catastrophic under the old legislation, but the new legislation doesn’t take GCS into consideration. Even though investigators concluded he wasn’t at fault in the accident, Bari and his family face mounting medical bills with bankruptcy looming. His injuries are so debilitating that he might never be able to work again and his wife had to cut her hours to take care of him. Canadian legislators justified the change in law by claiming it would lower premiums. But it carries devastating unintended consequences for injury victims like Bari. If similar legislation were passed in Wisconsin, Illinois or Iowa, it could have similar unintended consequences for injury victims on this side of the border. Wisconsin already has legislation in place that protects insurance companies at the expense of injury victims by imposing caps on noneconomic damages. Although the law is intended to protect the public, often times, that isn’t the case.